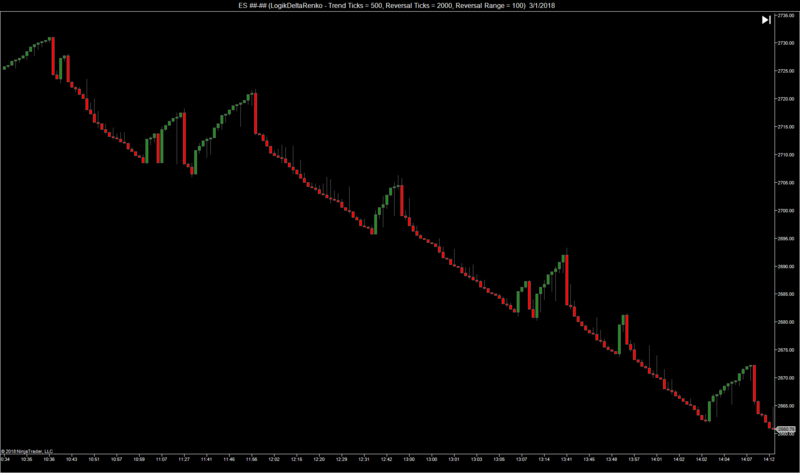 The LogikDeltaRenko is a unique Cumulative Delta based bartype with Renko like trend and reversal attributes. In order to gain a higher level aspect of market activities, the LogikDeltaRenko fuses market price with buyer volume vs seller volume (non-forex). It has inputs to set the Trend Cumulative Delta, Reversal Cumulative Delta, and Reversal Ticks, thus granting maximum ability to maintain the underlying market sentiment while minimizing volume based reversal lag. Cumulative Delta is the algebraic sum of the difference of two measured values. This measurement can be done in two ways. Up Tick / Down Tick – One method of measurement is to use whether the Current Tick is greater than or less than the Prior Tick. If it is greater than, it is an uptick and counts in the upward direction. If it is less than, it is a downtick counts in the downward direction. 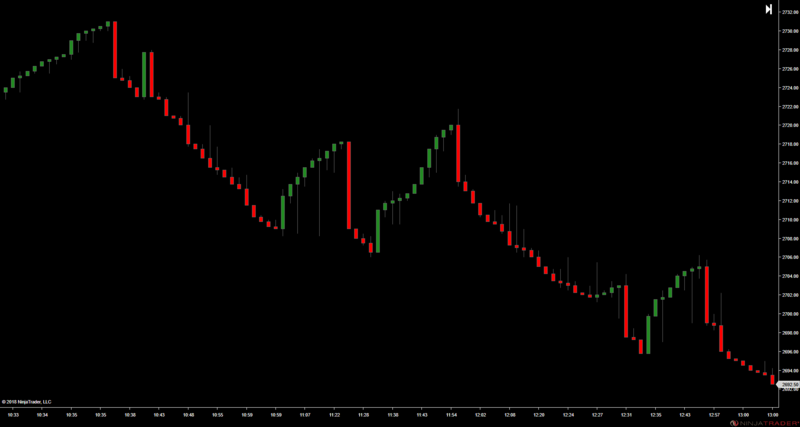 This is the implementation in NinjaTrader 7 (Left Chart Below). Ask Tick / Bid Tick – Another method of measurement, and the traditionally as well as potentially a truer representation, the measured values consist of Bid and Ask ticks, whereby an Ask Tick counts in the upward direction and a Bid Tick is counted in the downward direction. 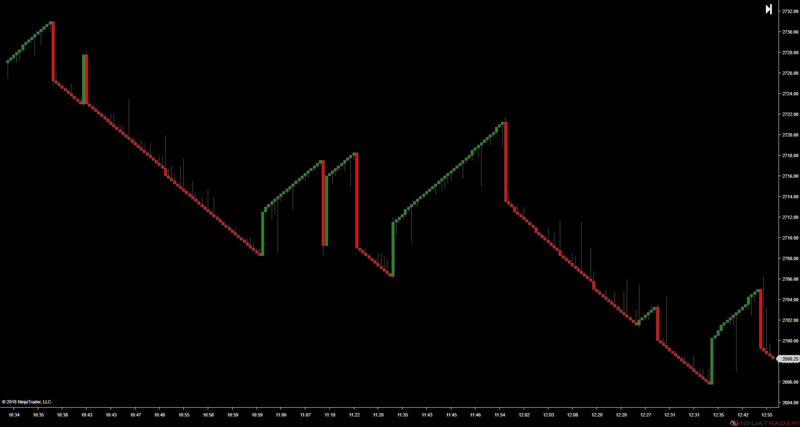 This gives a more “true” representation of the buyers vs sellers as is the primary goal of Cumulative Delta. 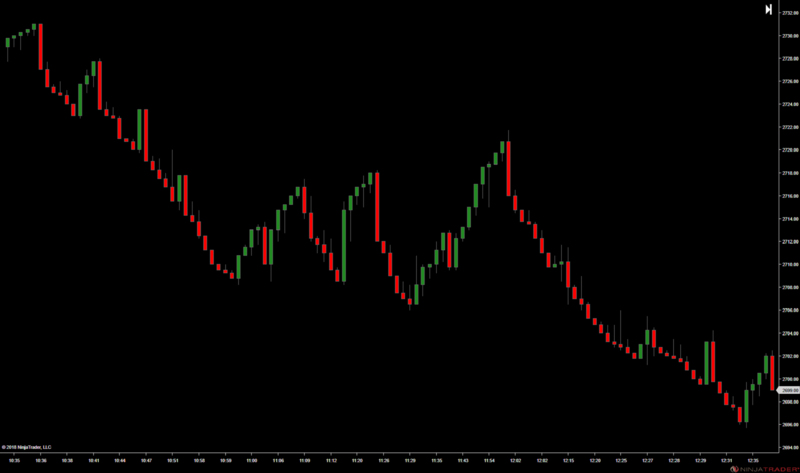 Due to a limitation of bartypes in NinjaTrader 7, this implementation is only available in NinjaTrader 8 (Right Chart Below). A new brick is created in the same direction of the current brick if the tick delta completes the trend ticks delta amount in the same direction. The LogikDeltaRenko grants the ability to specify the delta measurement to complete a bar in the direction of the current trend. By having control over this parameter, it can be required to have more or less force in the current trend direction to continue the trend. This parameters is in ticks. It can be seen through these images, that as the Trend Ticks decreases, the trend is more prominently dictated. This is because as the threshold to complete a bar in the direction of the trend decreases, a bar is created in the direction of the trend more easily. 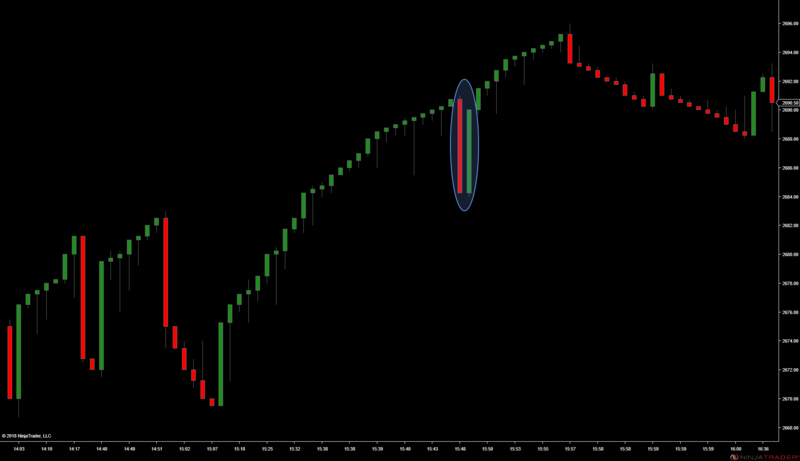 A new brick is created in the opposite direction of the current brick if the tick delta completes the reversal ticks delta amount in the same direction. The LogikDeltaRenko grants the ability to specify the delta measurement to complete a bar in the opposite direction of the current trend. By having control over this parameter, it can be required to have more or less force in the current trend direction to reverse the trend. This parameters is in ticks. 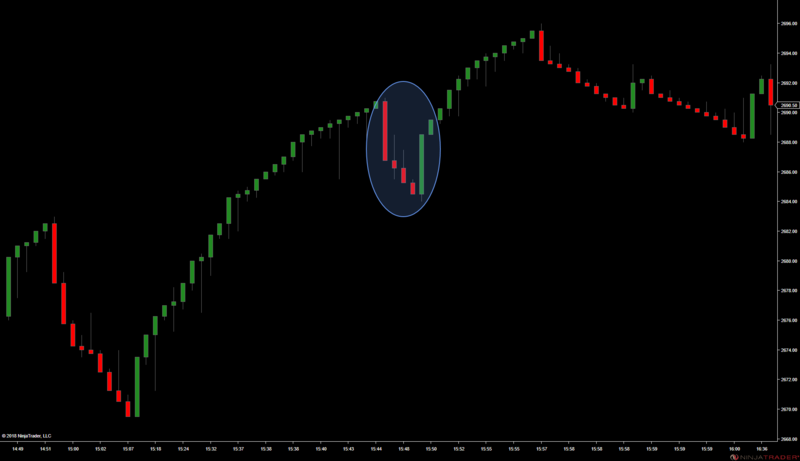 It can be seen through these images, that as the Reversal Ticks increases, the trend is more prominently dictated. This is because as the threshold to complete a bar in the direction opposite of the trend increases, more pressure is required in the opposite direction to create a reversal bar. The LogikDeltaRenko grants the ability to specify the tick range reversal measurement to complete a bar in the opposite direction of the current trend, or, the reversal bar. By having control over the parameters, reversing lag during a strong market reversal is minimized. This parameter is in ticks. 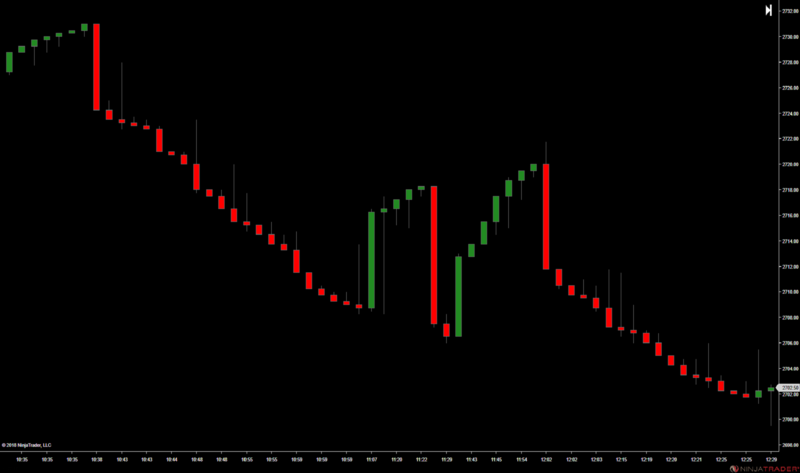 The below / left chart illustrates the Reversal Tick Parameter set to 100, essentially disabling it. The below / right illustrates the Reversal Tick Parameter set to 16, thereby creating a reversal bar if the market moves against the prior close by 16 ticks. It can be see by comparing the highlighted area in both images that the lag of the single long reversal bar can be minimized by setting the appropriate reversal tick parameter. The Forex market has no centralized exchange which provide true volume data. 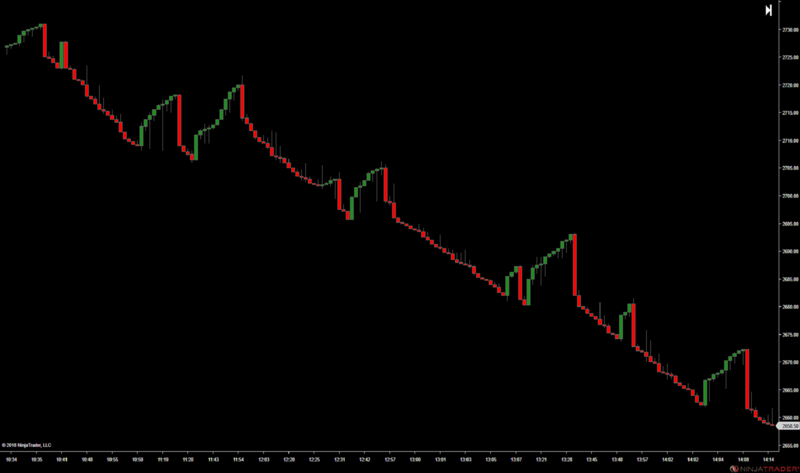 Volume on Forex is simply a tick counter of price transactions. Since tick volumes are highly correlated with real volumes, the delta calculation as applied to Forex is a up tick count vs down tick distribution without incorporating volume into the summation. Depending on the real-time tick filter algorithm implemented by the platform, a spurious tick price may pass through from a broker’s data stream. 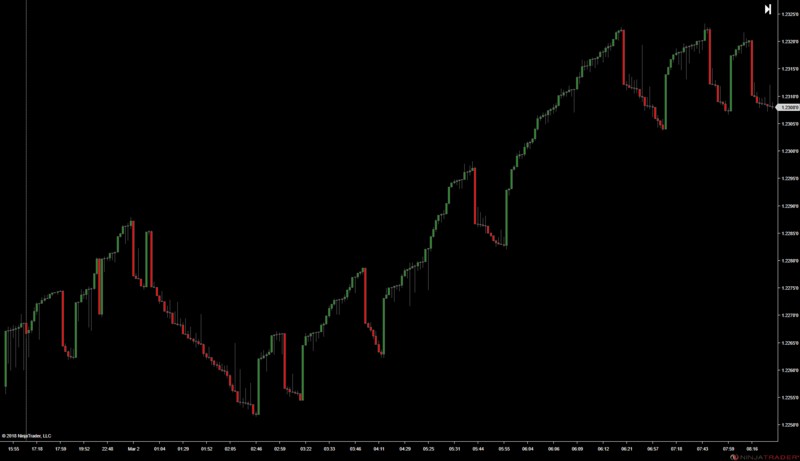 Since the Renko chart algorithm uses pure tick data as it is received from the broker, this noise may create bricks which are inconsistent with the true in a whip saw manner. Although the effect on the price is minimal since the chart price is dependent on the latest tick, any indicator applied to the chart will be useless since this price data is filtered into it. This effect increases as the input size of the brick decreases. 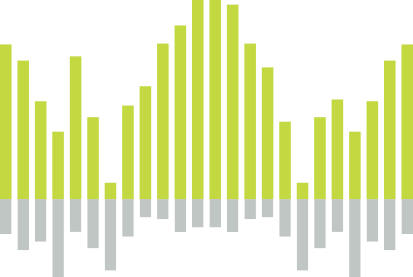 The LogikDeltaRenko implements a real-time tick filter independent of any other filter. The algorithm is designed to eliminate this whip saw effect without removing important price information. Spurious ticks are detected, classified, and disregarded. The LogikDeltaRenko depicts the true High / Low with a candle chart like wick to reintroduce this important price information lost with the traditional renko bar, while maintaining the benefit of isolating the underlying price trend. Additionally, due to the nature of the algorithm, the probability of a phantom bar is less than 1%. Futures and options trading has large potential rewards, but also large potential risk. You must be aware of the risks and be willing to accept them in order to invest in the futures and options markets. Don't trade with money you can't afford to lose. This website and the products, services and other information contained herein is neither a solicitation nor an offer to Buy/Sell futures or options. No representation is being made that any account will or is likely to achieve profits or losses similar to those discussed on this website. The past performance of any trading system or methodology is not necessarily indicative of future results. Use of any of this information is entirely at your own risk, for which PureLogik Trading will not be liable. neither we nor any third parties provide any warranty or guarantee as to the accuracy, timeliness, performance, completeness or suitability of the information and content found or offered in the material for any particular purpose. You acknowledge that such information and materials may contain inaccuracies or errors and we expressly exclude liability for any such inaccuracies or errors to the fullest extent permitted by law. All information exists for nor other than entertainment and general educational purposes. We are not registered trading advisors. Hypothetical or simulated performance results have certain limitations. Unlike an actual performance record, simulated results do not represent actual trading. Also, because these trades have not actually been executed, these results may have under-or over-compensated for the impact, if any, of certain market factors, such as lack of liquidity. Simulated or hypothetical trading programs in general are also subject to the fact that they are designed with the benefit of hindsight. No representation is being made that any account will or is likely to achieve profits or losses similar to these being shown.